British 20th C, except portraits, London: Artists and Subjects, Northern Ireland: Artists and Subjects, Wales: Artists and Subjects 34 comments Who painted this coastal landscape and where is it? Is this painting by one of the Belgian artists who were refugees in Britain in the First World War, and whose work was shown in a special display of their paintings and other works in the Royal Academy in its War Relief Exhibition in 1915? 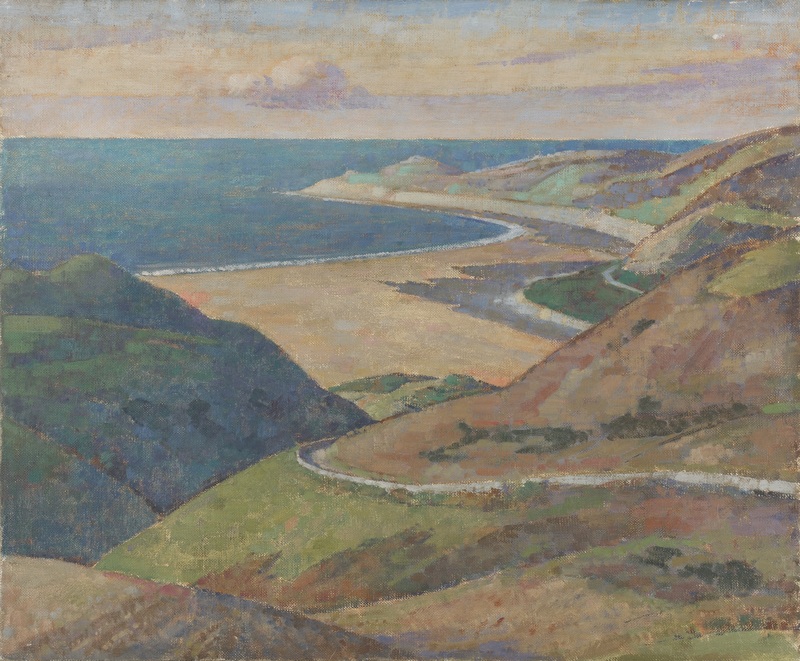 Could it depict the Welsh coast, such as Mwnt Beach on the southern end of Cardigan Bay, as some of them worked in Wales? Could it be by Valerius de Saedeleer (1867–1941), or by an artist close to him? See 'Art in Exile. Flanders, Wales and The First World War', Museum of Fine Arts, Ghent; Hannema-de Stuers Foundation, Heino; and National Museum of Wales, Cardiff, 2002, especially pp. 135–46. See no. 44 ‘Spring near the Ystwyth’ and no. 50 ‘Landscape in Wales’, both in private collections. If by Drummond, the coast could be the north west of Ireland, as he painted in Donegal in 1918. The PCF image of this painting is attached. Peter, there is a high-resolution image attached, which can be enlarged on screen. Looks remarkably simlar to Morte Point at the north end of Woolacombe Bay in north Devon, if a certain amount of artistic licence is assumed, possibly before the later development of the village and at low tide. 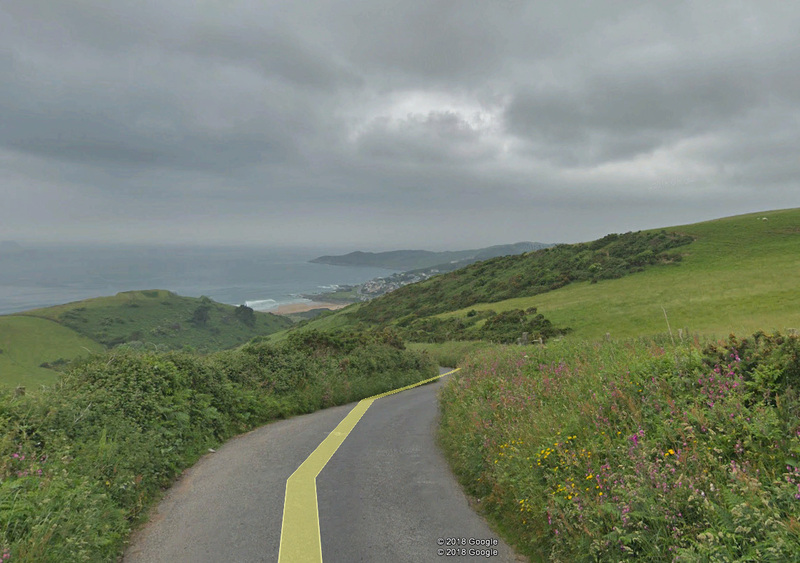 Attached is a view taken from Google streetview looking NW toward the bay on the road leading SE from Woolacombe (Challacombe Hill) at OSGR 46400 42630. If correct, the painting might have been taken from a point on higher ground above that road. Llangrannog or Cwmtydu perhaps?, but from a specially chosen viewpoint, rather than a quick snap taken from the footpath. There are one or two Google images that do look similar. Rhossili bay looking north along the beach. Unfortunately all the images on google (see attached photo) are taken from the path down to wormhead and appears in the painting as the left hand foreground.This picture is a more unusual,very much like the view from about 500yards to the right of the google photos where the path from Rhissili villages heads down to the beach. Well worth a visit! Thank you to everyone for your comments. Peter, first thoughts are often accurate and I don't think that Keith Henderson was always more precise (as in the background landscape of 'Wings over Scotland', 1940). What are your thoughts about Malcolm Drummond? Regarding the location: Morte Point looks as if it could be a potential location, as the point has the right shape. Marion, would you be able to ask of the Royal Academy if it was or is their policy to only acquire works that had featured in their annual or Summer shows, or possibly that originated from their school system? Their reply might usefully narrow down the target area of enquiry as to the origin of this work and its purchase for or gift to their collection. Attached are two different views of Morte Point by way of suggesting that this is the correct location of this painting. The annotated image is just a suggestion as to what pints might correspond. The tidal movement exposes less of the beach on the satellite view. It might be that the view was painted from closer than Challacombe Hill and could be from a view along Sandy Lane. The question is where were all the houses of Woolacombe and surrounding area?Was this painting executed before there was any such development, or is it an idyllic interpretation of the place. 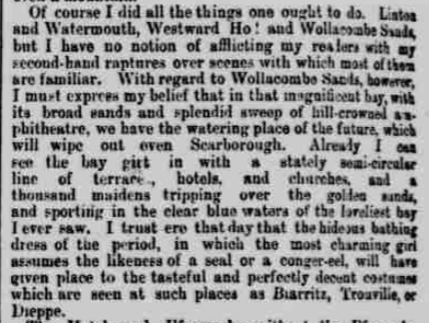 Judging by the (admittedly politically incorrect) description of Wollacombe Sands by "A Roving Correspondent", as it appeared in the Western Mail of Friday 2nd September 1870, the shore line by that date seems to have as yet been engulfed by holiday homes and the like. If a record of the main development (say by the 1890s) of the village could be found it might provide a small window of possibilities as to when the picture was painted. 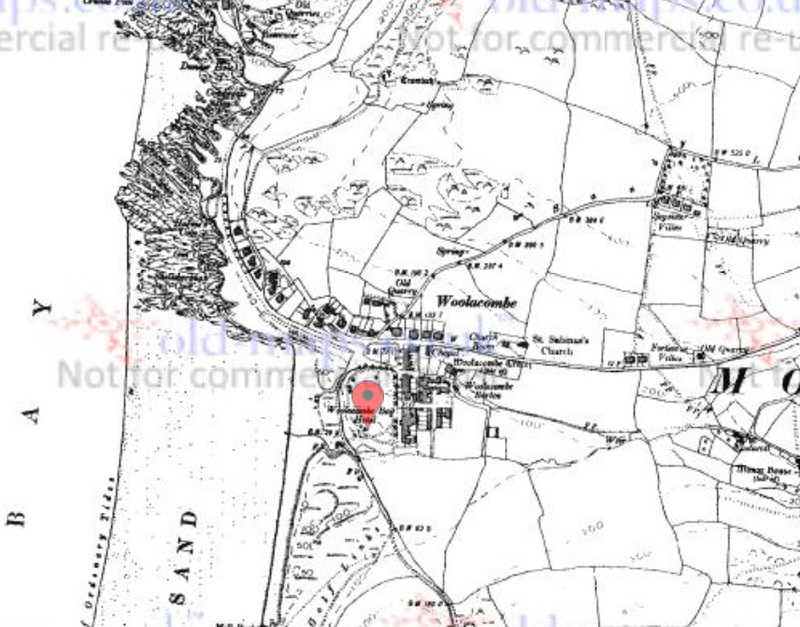 The Western Times of Friday 17th August 1883 reports that an application to the District Highway Board at Barnstable, on behalf of Lord Fortescue and the Trustees of the late Sir Bruce Chichester's will, asked for the Board's permission to widen the road that led from the Morthoe railway station to Wollacombe Sands, on the granting of which the road (now known as The Esplanade), would be dedicated to the public. This act, as may be subsequently deduced, most likely triggered the beginning of the rapid development of the village of Wollacombe. For instance, bathing machines at Wollacombe were advertised for the first time in June 1886, and permission for a provisional premises licence, for the about-to-be-named Shakespeare Hotel, was granted in September of that same year. In September of 1888, reference was made in the Devon Gazette to the "new road leading from Morthoe railway station to Wollacombe Sands". On Thursday 12th November 1891, the North Devon Journal announced that "There will be opened for Divine worship on Tuesday next an iron church which has ben erected at Wollacombe for the purpose of meeting a need which has arisen as a consequence of the rapid development of this remote portion of a picturesque and pushing (sic) parish." From all of the above, as a consequence of the arrival of the railways and of various highway improvements, which facilitated better access to the unspoilt beaches of the north Devon coast, it would appear that the pure natural landscape of Wollacombe, with its donkey tracks leading from the hills to the shore up to the early 1880s, was utterly transformed by the beginning of the 1890s. In fact, the transitional point for the development of Wollacombe can be clearly understood from the attached notice that appeared in the North Devon Journal of Thursday 29th December 1892. 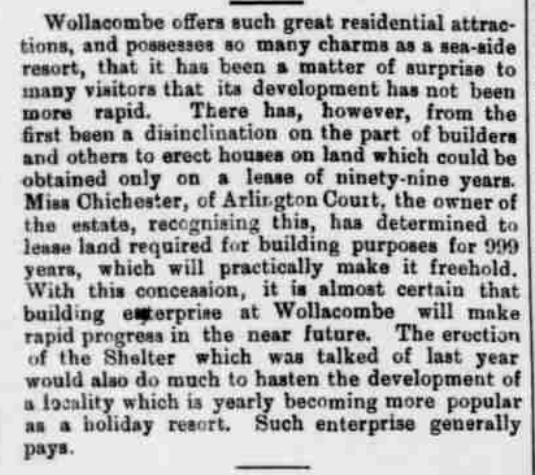 In its edition of Thursday 6th April 1893, the same paper ran an additional repot that succinctly describes Wollacombe's imminent transformation to a thriving resort. It is also attached, for all ArtUK's contributors' consideration. Given the complete absence of any human habitation in this painting, if it does represent a view towards Morte Point from somewhere above Wollacombe, then it possibly dates more likely from before or up to the very early 1880s rather than from any time after that period. Marion, thank you. If, therefore, the RA collection has in the main been acquired via members, students and the Summer Exhibition, it might be worth noting that a work by James S. Hill, of Ivy bank, Hampstead, entitled 'Morte Point, North Devon', was exhibited as entry number 119 in the 1880 summer exhibition. The Exeter & Plymouth Gazette of Saturday 1st May carried a description of the picture as "a scene of dull green rocks and a dull grey sea; a careful study of Nature's varying aspects." I know that is not necessarily what is on offer here, and I have seen other works by Hill online, though none has the freshness and clear and simple lines of that of this discussion. However, on the basis of my posting above, the date of 1880 does fall within the period of time when Wollacombe and its Sands would have been relatively unspoilt by development. 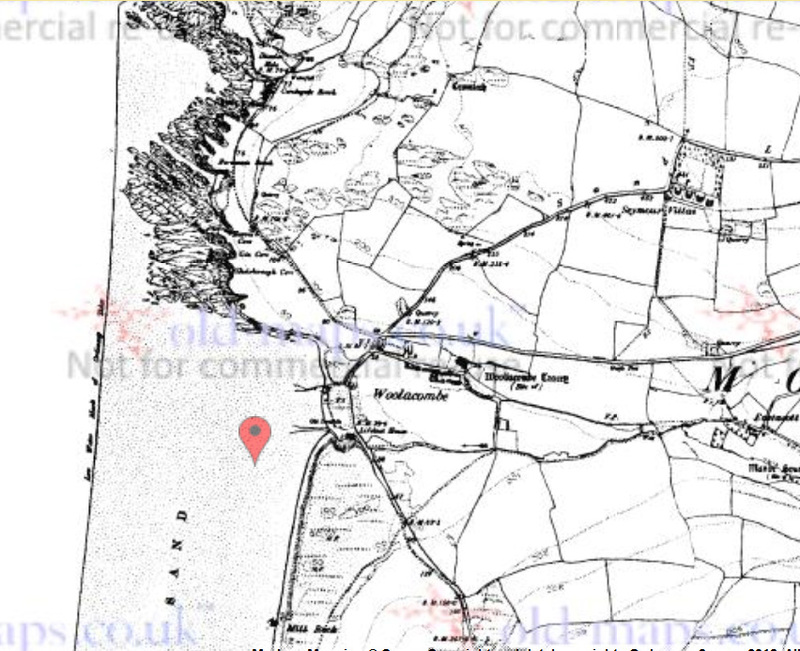 Further to the above comments, the extensive"development" of Woolacombe and the Esplanade appears to have occurred between 1890 and 1905, as is illustrated by the OS maps of those years (scans attached). I really don't think this is Woolacombe. I live about 10 minutes away and surf there regularly. There quite are a few Victorian/Edwardian villas along the Esplanade that would be visible and the hill gradiant is nothing like in this picture. I can't place this view anywhere on the North Devon coast. 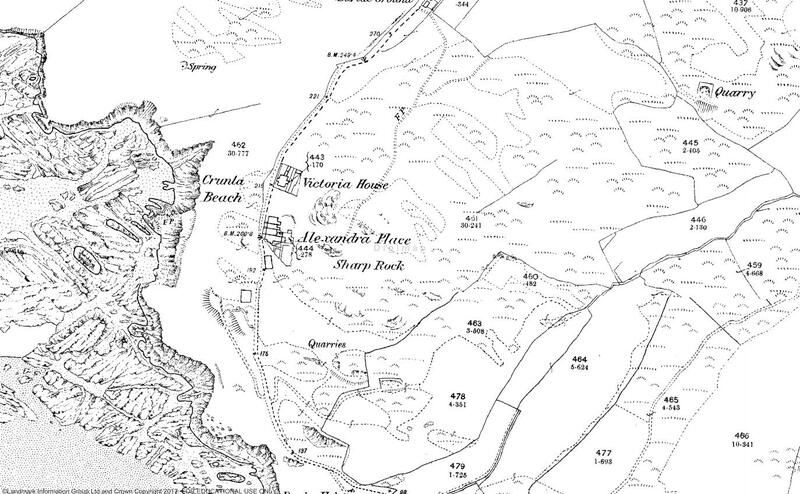 If this is a view towards Morte Point in the late 19th century, then it may be pertinent that the only buildings above Grunta Beach at that time were Victoria House and the adjacent Alexandra Place (subsequently the Mortenhoe Hotel - see attached extract from the OS 1st edition 1:2500 map). There appears to be a rectangular dab of paint at the correct location on the painting that may correspond to these buildings. https://bit.ly/2SwsNvJ. Sennen Cove was the frequent subject for both Laura and Harold Knight. This might be the obvious suggestion but could it be that place? Also it looks far more like a painting of the first half of the 20th century, rather than the last decades of the 19th century. Barbara, is that right? The phrasing in the first sentence of the RA's statement in the intro is admittedly confusing; but I think what follows (and the recent further statement from them posted by Marion) must mean that though at one stage it was thought possible that this painting was one of the eight canvases by Laura Knight that came from her Estate in 1972, it is no longer thought to be one of them. My reading of the email chain concurs with Osmund’s although I’m pleased that Barbara brings us back to a consideration of the possible author of the present landscape. We all may well have thumbed through Oil Paint and Grease Paint and The Magic of a Line hoping that the name of an artist-acquaintance might solve this problem. Looking at it one wonders why it should be so intractable. A work of such considerable sophistication should be easy to identify on stylistic grounds. I am surprised that none of the Camden Town/Bloomsbury experts has weighed in on it. Drummond is a good suggestion, but one might look at Bevan or de Karlowska for artists who sketch out a landscape in line before applying fairly dry pigment. However none of these seems to quite fit. Since this first appeared I’ve been looking a Hubert Lindsay Wellington – an interesting character whose work combines a certain dry academicism with a modern sense of the abstract. It’s probably not by him, but clearly we need to find a painter – English possibly rather than Belgian – who if not in the same room as Laura Knight, sometime around 1920, was at least au fait with recent developments in painting after the Post-Impressionist show of 1910. Thanks, Osmund. Yes, my mistaken misreading. Apropos Kenneth's remarks, totally agree it is a sophisticated work and hopefully it can be attributed with eyes more expert than my own in this area to comment. I agree that this looks more like a work of the first decades of the 20th century. Mine are not expert eyes, but could it possibly be by Walter Bayes, who was also in Devon in 1918? Walter Bayes is a very good idea- it has the air, if British, of an artist on the edge of the Camden Town Group. Marion, as the question inevitably wheels around at this stage in the guessing game, is there an available shot of the back of this work, one which that might provide further clues as to its attribution? If it was exhibited at the RAn, might it still retain a catalogue identity number? 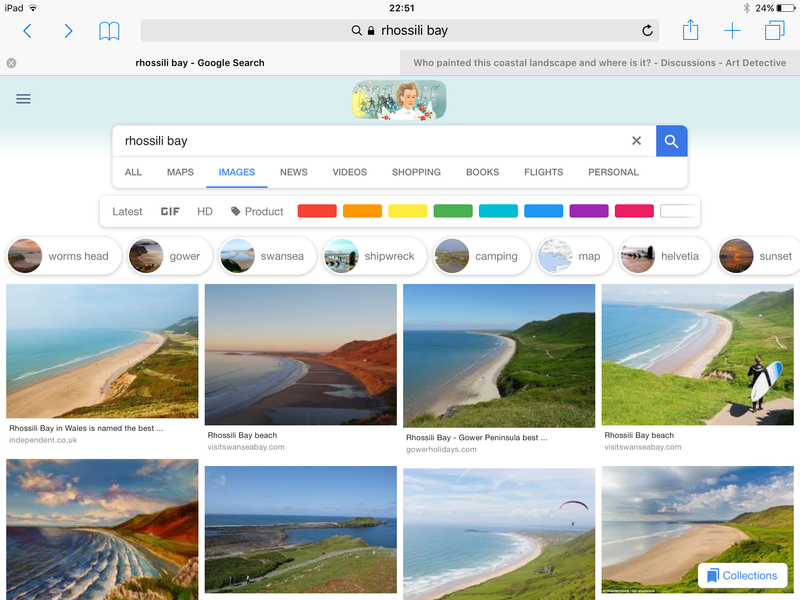 Ooops, a slip of fingers on the keyboard - "If it was exhibited at the RA,...... "
Regarding Maggs Barker's suggestion above of Rhossili Bay. I believe that the hills fall away there much earlier and the northern tip of the bay is more definitely divided from the mainland than is depicted in this discussion's painting. In 1918 and 1919 the Leicester Galleries held one man show of his paintings. Sickert wrote in the catalogue to the former. The Carfax Gallery had one man shows of his work in 1913 and 1915. Bayes's exhibits with the London Group 1913-15 should be checked - also his paintings at the Allied Artists' Association. The fullest account of him can be found in ODNB. As a painter, his friendship with his boss at the National Gallery, Charles Holmes , needs investigating.